If you are looking for an easy trip from Salt Lake or Utah County with free-roaming horse encounters almost guaranteed, this is your destination. Want to learn more about the horses and history of this incredible mustang viewing area? The Onaqui Mountains stand near the southeastern corner of Tooele County, separating Dugway on the western side from Rush Valley and Vernon to the east. The designated HMA encompasses the foothills between Rush Valley and Vernon, stretching roughly 30 miles southwestward to include the Simpson Mountains. 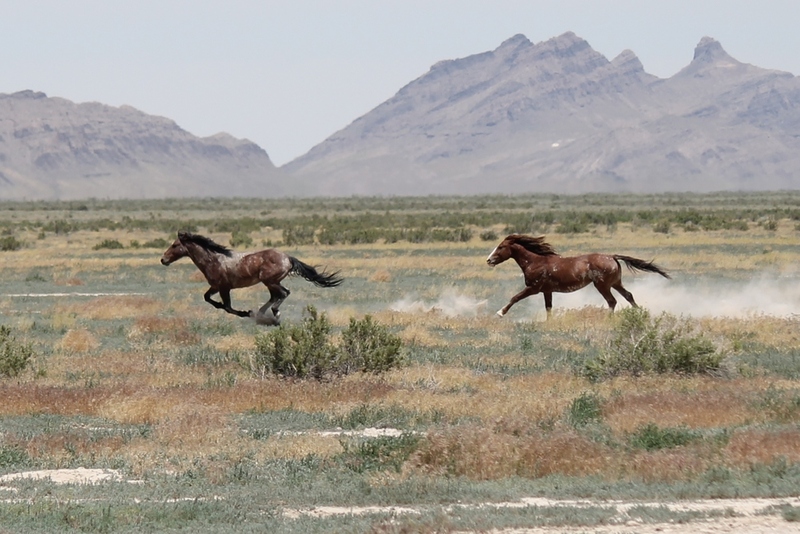 The Onaqui herd is relatively large, around 450 horses, and provides the most easily accessible and reliable viewing opportunities of any Utah herd. A large band can almost always be spotted along the historic Pony Express Road between Simpson Springs and the Old River Bed channel. Smaller bands and individuals also frequent the areas east of Simpson Springs toward Lookout Pass and north toward Dugway. The Pony Express Road is a very well maintained gravel road running generally west all the way to the small town of Callao, and north toward Gold Hill. This is an official National Back Country Byway, providing exclusive access to numerous historical sites and recreational locations, including the Simpson Springs campground, the Dugway Geode Beds, and Fish Springs National Wildlife Refuge, with monuments commemorating the location of Pony Express way stations at several points along the way. Conditions are dusty, but easily traversed by the family sedan when dry. As always, be aware of recent or impending weather events to avoid mud hazards. I have yet to travel the 7 mile stretch from Simpson Springs to the Old River Bed without seeing numerous members of this herd -- sometimes at binocular distance, and other times immediately beside the road. While most free-roaming horses are understandably shy and wary of encroachers, many members of this herd seem highly habituated to the presence of humans and their noisy machines. That said, you should never attempt to interact with these animals in any fashion. Even seemingly tame free-roaming horses are easily spooked, and can cause serious injury or death without warning or direct provocation. Additionally, your efforts to feed or pet these animals may condition them to allow others to approach whose intentions might not be as benevolent as your own. Please refrain from exposing yourself and these animals to potential harm! And if my warnings are not enough, bear in mind that it is a violation of federal law to chase, harass or harm free-roaming horses in any way. The shortest route from Salt Lake City runs through Tooele and Rush Valley. An alternate path through Skull Valley adds about 15 miles to your journey, providing access to the Big Creek and Cedar Mountains areas along the way. Some may prefer the slightly longer route through Utah County (directions further below). For the shortest route, take I-80 west from Salt Lake City to Exit 99 toward Stansbury Park and Tooele. Travel south, continuing on Highway 36 about 40 miles through Tooele, Stockton and Rush Valley. Watch for the sign marking the turnoff toward Fish Springs Wildlife Refuge and the Pony Express Route, about ½ mile beyond mile marker 27. Turn right here onto Lookout Pass Rd/Pony Express Rte. Follow the main road 25 miles to Simpson Springs. Sightings become increasingly likely through the final half of this leg. For the alternate route through Skull Valley, take I-80 west from Salt Lake City approximately 43 miles to Exit 77 (U-196, Iosepa/Dugway). Upon exiting, turn left at the stop sign and continue south along UT-196 for approximately 37 miles to Dugway. As you approach UT-199, you want to access the dirt road running immediately west of the church. The easiest way to do this is to follow the short dirt path providing a direct line across Highway 199. Continue south about 10 miles to Pony Express Road, then head west (right) another 9-1/2 miles to Simpson Springs. Sightings are very likely through the 15 miles stretch west of this point. Round trip from Salt Lake City to Simpson Springs and back is about 200 miles, roughly 40 of which are on dirt roads. Gasoline is available in Vernon, about 25 miles east of Simpson Springs along the Pony Express Road. From Northern Utah County take Pioneer Crossing west from American Fork (becomes UT-73) about 42 miles to UT-36. Turn left and continue 3-3/4 miles to UT-199, then head west another 22 miles toward Dugway. Approaching the Dugway military entrance, turn left onto the dirt road running along the west side of the church building. Travel south about 10 miles to Pony Express Road, then head west (right) another 9-1/2 miles to Simpson Springs. Continue westward, as best viewing opportunities tend to occur between here and the Old River Bed about 15 miles west. Pony Express Rd/Simpson Springs: As noted above, a large band seems to favor the long stretch between Simpson Spring and the Old River Bed. 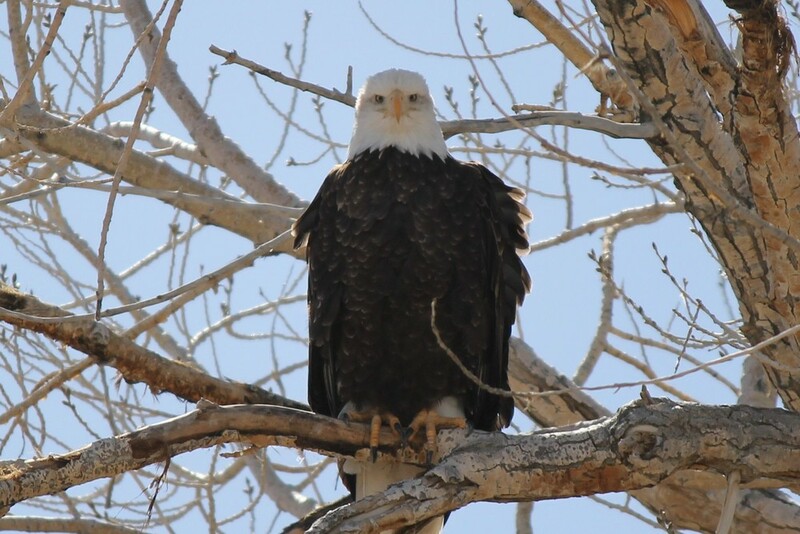 I have also frequently spotted singles, pairs and smaller bands along the road between Dugway and Pony Express Road. Davis Mountain: With a high-clearance vehicle, you can make the 15-mile trip around Davis Mountain and its northern companion peak, Round Top. The band above was spotted grazing Round Top’s northern slopes. There are two primary access points from Erickson Pass Road between Dugway and the Pony Express Road. The directions below will take you to the main watering hole through the mountain’s southern foothills. From Simpson Springs, head north and east 9.5 miles to Erickson Pass Road. Watch for the large BLM sign pointing toward Dugway – if you are coming in southward from Lookout Pass, this will be the second signed turnoff to Dugway you encounter. Drive north 0.6 mile to the fence line and turn left onto Davis Mountain Road immediately after crossing the cattle guard. Follow this road as is winds through a narrow valley along Davis’ southern foot, generally west 6.5 miles to the watering hole on the west side of the mountain. To continue around Round Top and the eastern slopes, proceed north from the watering hole, turning east after 2.6 miles. Follow as the road runs east then northeast 1.6 miles. This brings you to the intersection with the northern access road. The left fork will return you to Erickson Pass Road, about two miles north of your original entry point. Take the right fork to continue along the eastern slopes. The road runs southeast, then almost directly south, intersecting the southern access road after 4.6 miles. Your original entry point from Erickson Pass Road is 1.0 mile to your left. Relics of 19th Century buildings, including a replica of the original Pony Express home station, still stand near Simpson Springs Campground, and OHV trails cross and circumscribe the Simpson Mountains stretching to the south. The Old River Bed is remnant of a Pleistocene epoch (c. 12,000 years ago) river that drained the Sevier basin into dwindling Lake Bonneville (which late-arriving locals and modern cartographers insist upon calling the Great Salt Lake). 25 miles southwest of Simpson Springs, in Juab County, the Dugway Geode Beds are a popular destination for rock hounds. Another 15 miles west of the geode beds, Fish Springs National Wildlife Refuge is a true oasis in the desert, with a network of large ponds frequented by a variety of local and migratory waterfowl. The refuge is designed for touring by automobile, with designated viewing and resting areas.